Save money and turn out amazing BBQ results with the BBQ Vortex by your side. 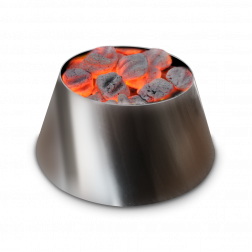 The BBQ Vortex allows you to take control of your fire by redirecting the flow of heat in your charcoal BBQ pit. Whether if you’re looking for the perfect searing zone or true indirect heat flow across your drum smoker, kettle, or ceramic grill, the BBQ vortex with save you fuel by allowing you to direct your flames and provides you with delicious BBQ results. - The BBQ Vortex is one of the best BBQ accessories on the market. 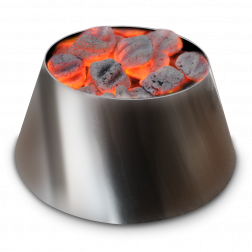 Take control of your fire and reduce your charcoal waste with the BBQ Vortex. 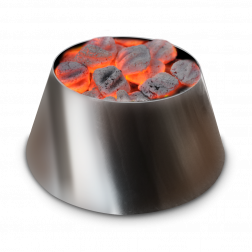 It allows you to turn out top BBQ results by redirecting heat in your charcoal cooker. Use it for searing, indirect cooking, and more. Become a master charcoal cook today! Turn out top backyard BBQ results with the best BBQ accessory for charcoal grills and smokers, the BBQ Vortex. The BBQ Vortex allows you to reduce charcoal waste all while giving you the versatility to cook with both indirect and direct heat. It's a BBQ tool you'll never want to cook without. Get yours today! Reduce your charcoal waste and turn out top BBQ results with the BBQ Vortex. It gives you full control over the heat of your pit, making it the ultimate BBQ tool for charcoal cooks. Get yours today!